Three L.A. County-based theater companies without permanent facilities have again been selected through a competitive process to present at [Inside] the Ford. The 2010-11 season opens on October 30 with the world premiere of HYPERBOLE: origins, created by L.A.'s designer-based Rogue Artists Ensemble (Gogol Project, The Comical Tragedy of Mr. Punch). On January 22, the Neo Ensemble Theatre (The White House Murder Case, Fortinbras), a company dedicated to the celebration of humor within the human condition, will present the Los Angeles premiere of the whimsically quirky Free by Barbara Lindsay. Closing out the season, Vs. Theatre Company (On an Average Day, Blackbird) will present the Los Angeles premiere of Tony-nominated Neil LaBute's shocking and darkly funny two character drama, The Mercy Seat. 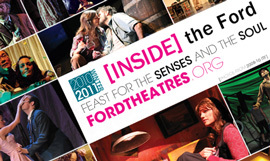 The play series at [Inside] the Ford have been resounding critical and popular successes. "A big plus for the decade came from the Los Angeles County Arts Commission, whose funding of various companies at [Inside] the Ford has given us some of the richest programming of the seasons," wrote Steven Leigh Morris in his LA Weekly "The Best of L.A. Theater in the '00s" column last December. "The Arts Commission is proud to make possible exciting theater in a gorgeous space that both theater companies and patrons can afford," says Arts Commission executive director Laura Zucker. [Inside] the Ford is located in the Ford Theatres complex at 2580 Cahuenga Blvd. East, Hollywood, CA 90068, just off the 101 Hollywood Freeway across from the Hollywood Bowl and south of Universal Studios. On-site, non-stacked parking is free. A season subscription for all three plays is $45. Single tickets to HYPERBOLE:origins, FREE, and The Mercy Seat are priced at $20 with a special price of $12 for full-time students with ID and senior citizens. For information and to purchase tickets go to the Ford Theatres Web site at www.FordTheatres.org or call 323-461-3673.